For the first time in 23 years, southern Illinois was paid a visit by the President of The United States of America on Saturday, October 27. 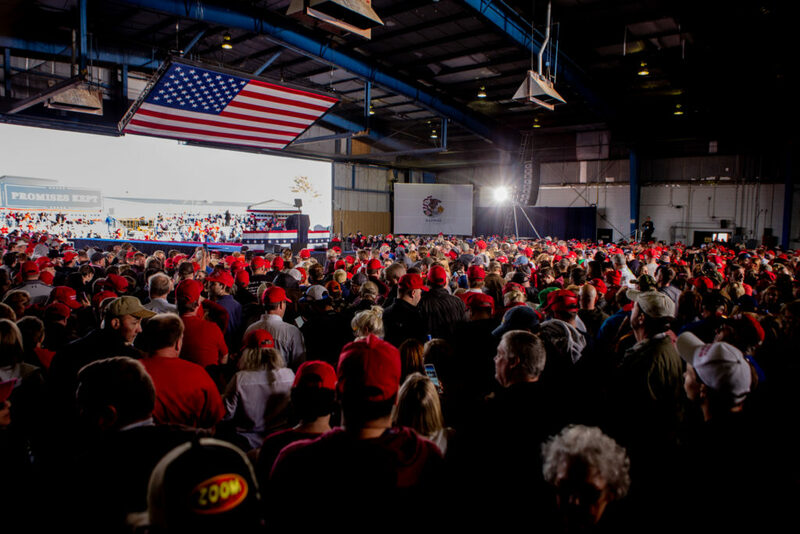 Thousands of people came from across the Heartland to see President Donald Trump as he spoke at the Southern Illinois Airport in Murphysboro, Illinois. The previous president to come to the area was former President Bill Clinton in 1995. Trump came to the area to endorse the incumbent Republican candidate Mike Bost for Congress. Bost’s re-election in the 12th congressional district is a close one against Democratic candidate Brendan Kelly. The president made sure the crowd knew that when he said this upcoming midterm election is the most important one so far, and if his supporters wanted the results to continue they must vote Republican. Upon arrival to the rally Saturday morning to report for WSIU Public Radio I noticed people wearing MAGA gear with media passes in the press box setting up their equipment. They belonged to the media outlet called Right Side Broadcasting Network, a conservative news and opinion media company that runs primarily on their viewer’s donations. However, throughout the network’s coverage of the rally, it was obvious the outlet is partisan, supporting Trump and his policies. Their live-stream of the rally briefly noted the hate crime in Pittsburgh and relayed Trump’s message disavowing anti-Semitism. The majority of the live stream’s commentary by Max Kleiber and Tom O’Neil focused on the importance of the upcoming election in Illinois for the Republicans to maintain and gain seats in the House. Although downstate Illinois has a large Republican constituency, the population hub in Chicago and the surrounding suburbs turn the state blue. Right Side mentioned this fact by following it up with a call to action for their viewers – to vote. Right Side speaks directly to Republican and Right-wing constituency groups. Their speaking points closely resembled Trump’s speech including his greatest accomplishments so far including tax cuts, fewer regulations, low unemployment and successfully nominating two supreme court justices. After Trump’s speech, Right Side stayed in the press box and interviewed members of the crowd who stayed behind to speak with Kleiber and O’Neil. Trump supporters welcomed interviews by the commentators and thanked them on-air for their hard work. Everyone they interviewed said they watched the network regularly. Some even said that Right Side is the only place they get their news. However, news should not be an echo-chamber enforcing people’s beliefs, and that is exactly what Right Side Broadcasting Network does. In a stark contrast to Right Side, CNN’s report of Trump’s speech in southern Illinois was critical of Trump’s rhetoric. CNN connected the mailed bombs being sent to Trump’s critics and the shooting at the Tree of Life synagogue in Pittsburgh to the culture Trump created by vilifying the mainstream media and the Democrats. Local coverage of the rally was much more focused on the crowd’s excitement for the president and briefly highlighted what was said by Trump. KFVS, WSIL and WPSD, the main news networks in the heartland, all live-streamed the rally. WSIL, which is based in southern Illinois interviewed members of the crowd after the rally who all expressed excitement and enjoyment from the rally. One man said it was the most exciting thing to ever happen to him besides the birth of his son. Another member said that he believed Trump was put in the presidential seat by God to save the country. KFVS, which is based in southeast Missouri, interviewed Trump after the rally. Their interview questions focused on the imposed tariffs by Trump, the effects they have on residents who live in southeast Missouri and whether Trump would visit to stump for Josh Hawley, a Republican going up against Claire McCaskill, a Democrat. The Daily Egyptian, Southern Illinois University Carbondale’s student-run newspaper, also reported on the rally. Their coverage reported on Trump’s supporters’ enthusiasm for the president, his late arrival to the rally, and a rebuttal from Brendan Kelly to the criticisms made by President Trump and Mike Bost.